Momentum is building for Scholarship Tax Credit bills HB 134 and SB 36. State lawmakers have received hundreds of emails and phone calls in favor of the legislation within the first few weeks of the 2018 legislative session. Several newspapers have taken notice of the support for Scholarship Tax Credits. 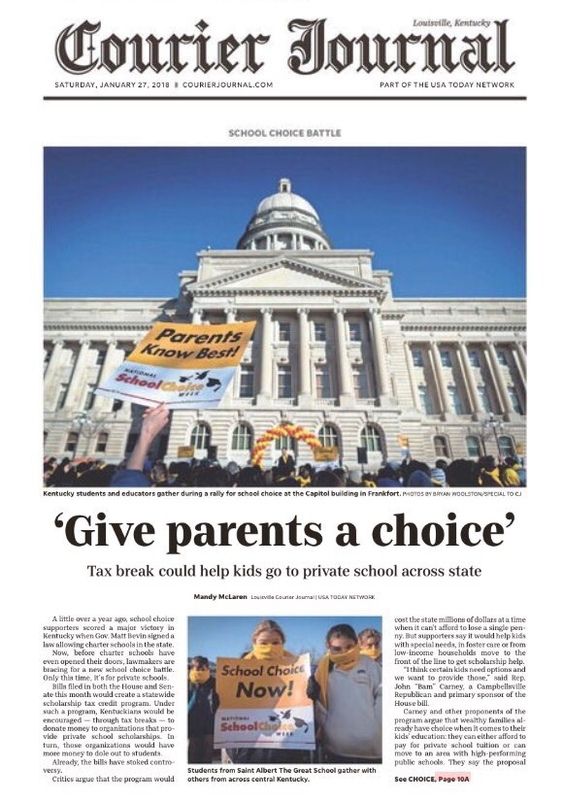 Most notably, the Courier Journal published a cover story this past weekend on Scholarship Tax Credits which featured pictures from the Kentucky School Choice Week Rally in Frankfort (see below). Legislators have taken notice of the issue. Now we need to make it abundantly clear that Kentuckians want to see Scholarship Tax Credits passed in 2018. We need you to take action! Please take one (or more) of the steps below to ensure that lawmakers act on this issue. If you have not contacted your legislators in support of HB 134 and SB 36, please use the “Take Action!” link below and do so today. It takes less than 5 minutes to help bring educational choice to Kentucky. Scholarship Tax Credit Bills – Take Action! If you have already contacted your legislators, please pass this message along to five friends or family members and encourage them to take action. They can also call 1-800-372-7181 to urge elected officials to support HB 134 and SB 36. The operator on the line will assist in getting the message to the correct Representative and Senator based on the callers address. The Kentucky General Assembly is considering House Bill 134 and Senate Bill 36. These bills create a Scholarship Tax Credit Program in Kentucky which would increase tuition assistance for students who want to attend non-public elementary and high schools, including Catholic schools. Please use the link found here to send your state lawmakers a message in support of Scholarship Tax Credit bills, House Bill 134 and Senate Bill 36. You can leave a message by phone by calling 1-800-372-7181. If you call, the operator on the line will assist you in getting the message to the correct Representative and Senator. Your voice matters. Make it heard by contacting your legislators today and encouraging others to do the same.